This week marks the official beginning of chassis construction. Not the chassis itself, but the construction of the Jigs we'll use to build the Rally Fighter chassis. 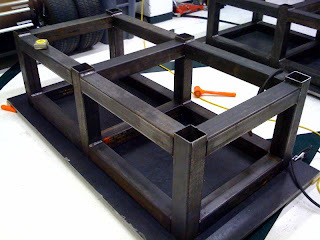 The images shown are the tables that Colby has been welding together and will serve as the platform from which the Jigs will be made. 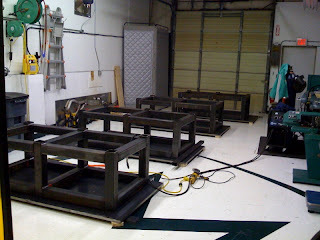 The tables are being built upside down for ease of fabrication and accuracy. The table tops are 1" thick steel which were cut from a 4' x 8' plate, making them very durable and a true surface to work from. The tables will not become the jig, but serve as an accurate, highly durable surface to build tooling from. Rather than fabricating a table and integral framework specifically for the Rally Fighter, building these tables for tooling will allow us to build not only the Rally Fighter Jig, but several others for component parts and eventually, other vehicle jigs and components. Furthermore, rather than purchasing a machined table which can cost tens of thousands of dollars, we elected to spec out the needed steel and build our own. This approach allows us to build very inexpensive, purpose-built, and accurate tables which will translate into Jigs with the same characteristics. You will also notice that there are several tables. We decided to make the table in sections to allow us flexibility as we move forward to separate the table into smaller sections for transitioning from vehicle jig construction to component fabrication, and building jigs for smaller vehicles we will have in our portfolio in the future. 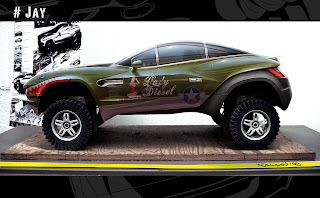 Preliminary performance specs are now up on the Rally Fighter Build Process page. We're still in development so some of these numbers may change, but we thought we'd share some of them to give everyone an idea of what we have planned. Although the specs are somewhat limited, once we begin testing of the first prototype months away, we will have more performance specs like you'd expect to see on a vehicle website, in a magazine, or witnessing them first hand in the vehicle, out on the street or off the beaten path in the American Southwest. This week at the SAE World Congress, the Scuderi Group gave the world it's first look at a physical protoype, compared with the computer generated simulations we've seen thus far. As I've mentioned, there's already a protoype undergoing assembly and testing. Scuderi says it should be running by the middle of May. 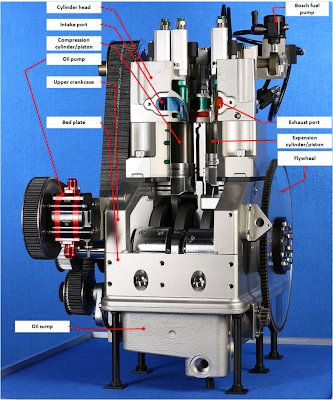 The cut-away model seen at the SAE World Congress is an exact copy of that protoype. When I was working on the chassis today in the area of the Rocker Panel and the Belly Scoop, I decided to do some further research on the P-51 Mustang to check the proportions and if there was anything that I would need to consider with the chassis design to maintain this feature and make it as close to the original as possible. 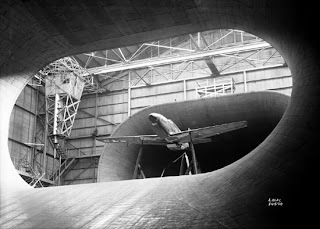 This is an image of the P-51 in the wind tunnel at Langley Air Force base, one of the four largest tunnels in the world, despite being built way back in 1931. 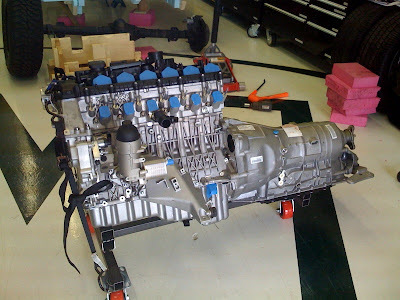 Now knowing that the P-51 was tested there, and having been there to test the Factory Five GTM myself, this would be a great place to test the Rally Fighter given the ties that both our engineering team and the RF design inspiration we have at Local Motors. Although the reasons to test the Rally Fighter in the tunnel are not as significant as those for testing the GTM and even moreso the P-51, it would be great to see the Rally Fighter amidst the twin 36-foot diameter fans just like it's "grand-daddy," the P-51. Adding to this visual comparison would be the results of conducting the test, also something I think would be cool to have, although given the use of each of these greats in design history, I'm sure the p-51's drag coefficient is far superior. 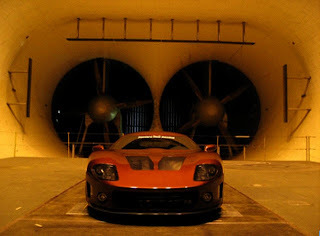 For those reasons, I don't see wind tunnel testing in the future for the Rally Fighter, but the possibility definitely got me thinking today about the car's history and the marketing and historical significance of getting it in the tunnel. Even if it doesn't make it into the tunnel, it's no matter...we'll still be taking flight in the Rally Fighter later this summer! 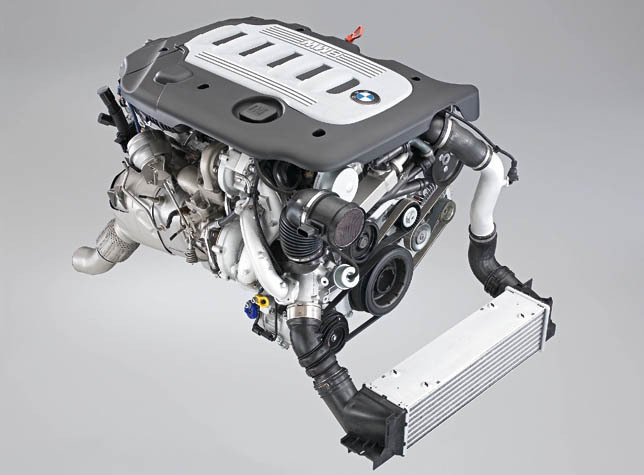 Now that we've made the switch to the BMW powerplant, we need to dress the engine, scan it, and put it in the model to check the fit and design engine mounts. However, since we are waiting on some of the parts to complete the engine, and we need to keep moving forward, we've had to make a few engineering assumptions, and continue with the scan so we don't loose valuable time in the development of both the body and the chassis. What we've decided to do is assemble the parts of the engine we can that will be on the outer portions, and estimate the rest of the area that the engine will take up once fully dressed. 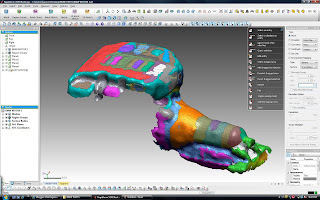 The way in which we've done this is pretty simple - take a look at a completed engine in a car, take some quick measurements and block off the area they will occupy to create a rough engine envelope.